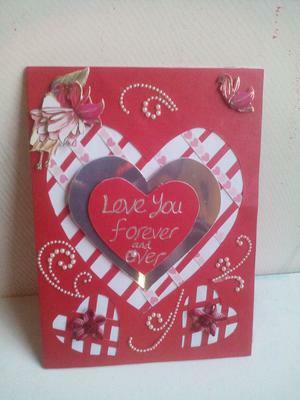 I have always thought of making cards with love shapes, it had been like a fantasy but now am glad it is a reality. I finally came up with this red nighty card sized 14.5 by 19.4 cm. Cutting out this love shapes with a cutting knife was truly challenging but at the end I achieved my desired outcome. 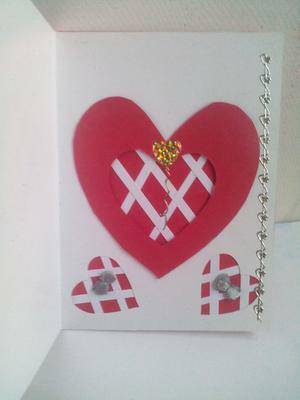 The technique for making a trellis card by Christina is what I have used for the big heart(love shape) in the middle and the ones by the bottom left and right as well. Her ideas generously shared has helped in widening my thinking ability. I decorated the top and bottom(Hearts) with red flowers already made for pasting.I made use of pearls once again and this made it look really nice and attractive. 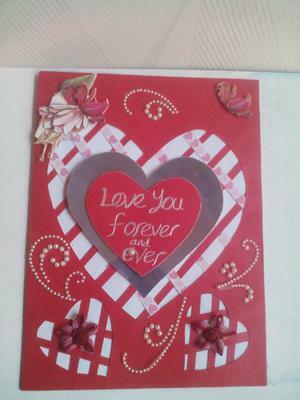 A white card is what have used inside and the same trellis pattern was used, hearts were weaved with white trellis work on a red background. I decorated using 2 silver billy bows and the rest are peel offs stickers. I love the dramatic red and white and the Trellis work is lovely. Thank you for your kind words and I am glad that you enjoyed the tutorial. Hi Olus. What a lovely card! You have been "very" busy making cards. It's a wonderful hobby isn't it! Thank you for sharing. Enjoy your day. You have done it yet again with your cards. Red and white are always acceptable, particularly when hearts are in-cooperated in the design.